Do your students tend to focus on more on what they want to receive during the holiday season instead of what they can give? 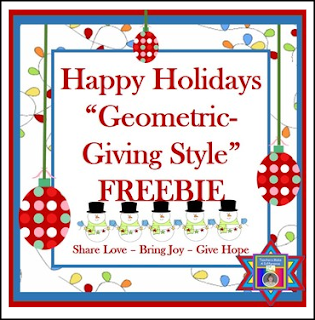 Help them focus on giving love, joy, or hope to others while using geometry in a fun way for the classroom. This resource is intended to help students understand the relationship between a net and a solid and guide students to focus on “giving” during the holiday season instead of “receiving”. You can use the nets which are already filled with different designs and/or the blank nets to have students decorate as desired. Once decorated, the nets can be laminated (if you choose) and then cut out by only cutting on the boundary lines of each net. The student will then fold on each internal line so that the three-dimensional solid can be made. Use tape to join all edges except one. On the blank notes provided, students can decide who they would like to give their ornament to and complete the note to place inside of the ornament before it is taped shut. Students will first decide if their note will “Share Love”, “Bring Joy”, “Give Hope”, or they can use the blank note. Students will write a message to the person that they will be giving the decorated ornament with the written note. The note will be folded, as needed, to fit inside of the ornament and the final edge taped shut. Students can have one single solid as an ornament or combine several of the solids together to make an ornament. These ornaments can be hung from the classroom ceiling, on a tree, or wherever the teacher chooses to use them for decoration. The students can then take them to deliver to their selected person after they are no longer used to decorate the classroom.